The new Nikon D750 wasn't the camera many Nikon fans had hoped for, a true successor to the vaunted Nikon D700. Whereas the D700 was basically a pro camera in a prosumer body, the D750 is a prosumer camera, period. As such, Nikon still hasn't launched a camera that can follow in the path of the D700. For Nikon fans, the D750 wasn't really needed. But for Canon fans jealous of the dynamic range that Sony's sensors deliver in the Nikon (and Sony A7 series) cameras, the D750 might well be the answer to their dreams. Because if the D750 is close to any other camera in specs, it's to Canon's 5D Mark III. 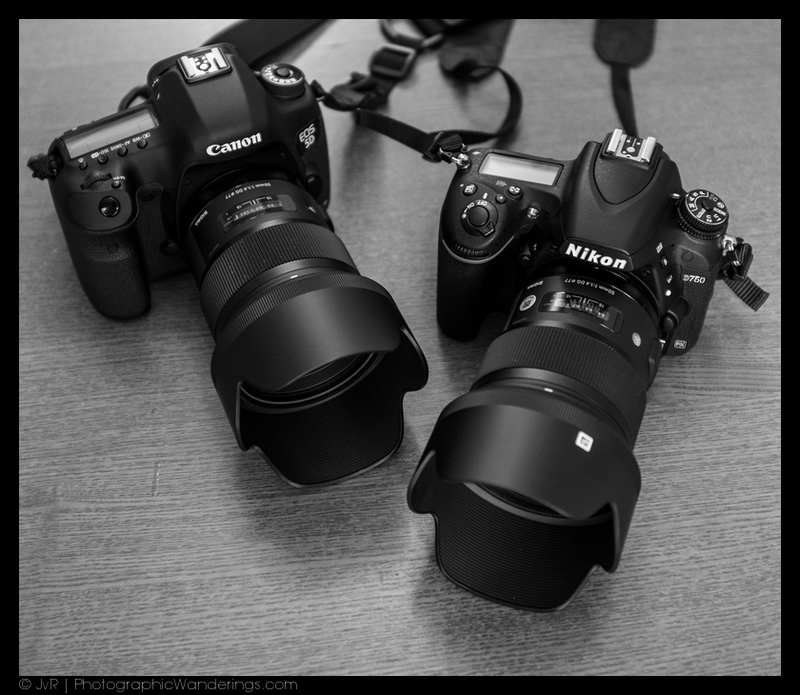 The only major difference seems to be the price, with the Canon being about $1,000 more expensive than the Nikon. That's why I wrote when the D750 was launched that it wasn't aimed at Nikon consumers, but at Canon buyers. Ever since Nikon introduced the D800(e) with an eye-popping dynamic range at low ISOs, Canon owners have been clamoring for similar dynamic range in a Canon body. And Canon hasn't delivered. Moreover, in recent interviews Canon reps have indicated they're pretty happy with their sensors while at the same time saying they're working on a high-resolution sensor. Until recently Canon 5D Mark III owners who wanted the dynamic range of the Sony sensors could do one of two things: buy a Nikon D600/D610 or a Nikon D800(e). In both cases, the bodies were less capable than their Canon and in the case of the D800(e), some didn't like stepping up to 36 megapixels. The other route was adding a Sony A7-series camera and a Canon-Sony adapter to their arsenal. Again, the Sony bodies don't stand a chance against the overall capabilities of the 5D III. Then Nikon added the D810, which improves on the D800(e) in terms of functionality. Still, it's 36 megapixels and it's priced in the same range as the 5D III. Nikon really upped the ante with the D750. Not only is it $1,000 cheaper than the 5D III, in terms of its specifications it's almost an exact copy of the Canon. And it presumably got that dynamic range that Canon owners could die for. Before going deeper into the specs, let's talk about that dynamic range. Some Canon owners say that if you just work your camera properly, you don't need that dynamic range and that the advantage disappears as the ISO gets higher. So, why bother? First of all, the dynamic range is really astounding. It's one of those moments where you get quiet for just a second as you see a dark image come alive in Lightroom, thinking it was completely unuseable. Yes, you screwed up your lighting, but 'wow' that technology is something else. These sensors seriously advance the latitude we have in our work. Now, coming back to the real world and to doing your work properly, it's true that the extra dynamic range in general isn't needed. It's nice to not see your shadows turns into a lumpy, stripy mess when you try to open them up, but if - like me - you like your shadows dark, you don't want to open them up anyways. I used to own a Nikon D800(e) next to my Canon 5D III and ended up selling all my Nikon gear, because I was used to Canon and love some of its lenses. I added the Sony A7r to get 36 megapixels if I want to work slowly, but I'm generally not clamoring for that extra dynamic range, no matter how much it impresses me. Still, others are, especially landscape shooters who don't like to darken their shadows but instead open up the scene. Now, with the D750 around, I can't fathom purely based on price and specs what real advantages the 5D III has over the new Nikon. If Canon before couldn't care less about the competition Nikon posed, the D750 surely must make them nervous. After the D750, what's the point of the 5D Mark III at $1,000 more? Let's look at those specs: both have full-frame CMOS sensors around 22-24 megapixels; their movie resolution is similar; Canon has a compact flash and a SD card slot, the Nikon two SD card slots; the Nikon has 51 focus points, the Canon 61; viewfinder specs are similar, but Nikon's rear LCD screen has a higher resolution and tilts; Nikon's ISO range is 100-12,800 with extensions up to 50-51,200, Canon's is 100-25,600 and 50-102,400; Canon offers a shutter speed of 1/8000, Nikon only goes up to 1/4000; the Nikon has a pop-up flash, the Canon doesn't; max sync speed is 1/200 on both cameras; the D750 offers up to 6.5 frames per second, the Canon up to 6 fps; the Canon weighs about 100 grams more than the Nikon. That's it in a nutshell. Some of these specs don't really matter, as the extendable high ISO's, for example, aren't really useable after a certain point. Likewise, the size of the buffer determines how much of those frames per second either camera can actually deal with for any duration of time. Looking purely at those specs, from my perspective, I'd say Canon beats the Nikon with that fast 1/8000 shutter speed, which really does make a difference if you want to shoot wide open in sunny conditions. I also prefer compact flash cards, as I think SD cards are too small, but I bet I'm pretty much alone in that regard. The Nikon wins, most likely, in quality of the sensor and with the price point. Still, much will come down to how these cameras actually handle and how the image quality compares. Image quality and shooting experience will have to wait for a later article, but after a bit of playing around and shooting with both cameras, I'd say you can't go wrong with either in terms of day-to-day handling. While I never had a problem with the grip on the Canon, I like the one on the D750 better. It's deeper, more comfortable. Most will prefer the On-Off dial around the shutter button on the Nikon, but since I leave my DSLR on once I start shooting, I have no problem with the Canon On-Off switch being on the left side of the 5D. I do admit that the Nikon setup is a bit easier. On the Nikon, the low position of the Live View button made me push it a few times by mistake. Not so on the Canon, where the button is high up on the back of the body. Canon's wheel works much faster than Nikon's four-way pad to quickly browse images. The Canon offers three personal pre-set options on its Mode dial, the Nikon two. The Nikon adds a bunch of scene and effects options and while the Canon only needs one point-and-shoot auto setting because it lacks a flash, the Nikon has two, one that will activate the flash if needed, the other one won't. The Nikon's tilting LCD is nice, but I figure it's more useful for video shooters than for still photographers. The other differences are mostly in button placement and the combinations needed to change settings. It's all very personal and it really will come down on what you prefer in terms of dials, switches and buttons over what the next person prefers. What is a big difference is the way Nikon incorporates the rear screen when changing settings. For example, when you press the ISO button, the rear screen lights up and you can see the changes you're making on both the rear LCD and the top LCD (and in the viewfinder). The Canon rear LCD stays dark under the same circumstances. Another major difference is the fact that when changing between auto-ISO and manual ISO, you press the ISO button and turn the front dial on the Nikon. If you're in manual ISO, you turn the rear dial to change the ISO. In both cases, you need to keep the ISO button pressed, a bit akward as the dial is on the left side of the camera. On the Canon, you press the ISO button and find auto-ISO at the beginning of the settings on the dial, so you can't switch between auto and manual ISO as quickly as on the Nikon, but on the other hand, you just press the ISO button once and then rotate the dial without having to keep the button pressed. Also the button is right below the shutter button, so it's much easier to change ISO while keeping your eye on the viewfinder. Not a big deal if you mostly use auto-ISO on either camera. I'm not going to comment on the autofocus operation yet. I leave that for the days ahead, when I take these cameras through their paces. Both are sporting Sigma's 50mm f/1.4 ART lens, so I can compare cameras and don't have to take the differences in lenses into account. I'm shooting RAW and JPEGs because the D750 files cannot yet be rendered by Lightroom, so at this point I can only compare JPEGs, which isn't a good way to compare the image quality of these kinds of cameras, since most will use them in RAW and the JPEGs are undoubtedly baked differently by Canon and Nikon. Hopefully, Adobe will update Lightroom soon. For now, I just say that they're both plenty fast and capable cameras. I'm still wondering how that Canon is worth $1,000 more, though.